After the gearbox had been dismantled, it needed to be degreased and cleaned before I could start putting it back together again. All the oil and grease was washed off the parts in the degreaser. When that was done, I sandblasted all the parts with a non abrasive glass bead medium. These glass beads can't do any damage to the surface of the parts as the glass is a softer material than the metal parts themselves. It can even be used on aluminum without damaging it. 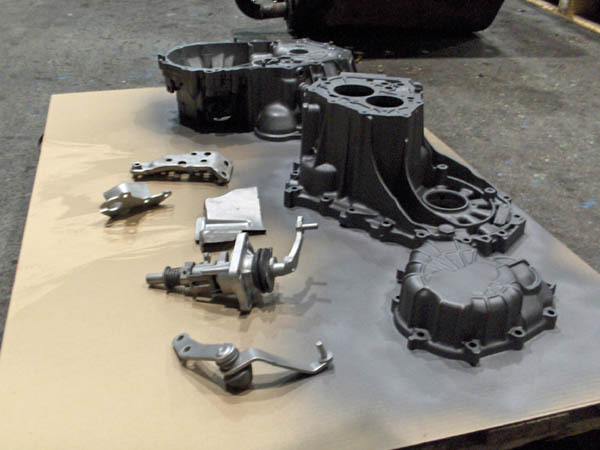 But it is abrasive enough to take all the material, dirt and corrosion off that has been collected over the years, leaving the parts looking like new again. and on the outer left a housing part that was first sandblasted and painted afterwards. In the picture above, you can clearly see the difference between and treated (sandblasted) and untreated aluminum housing part. 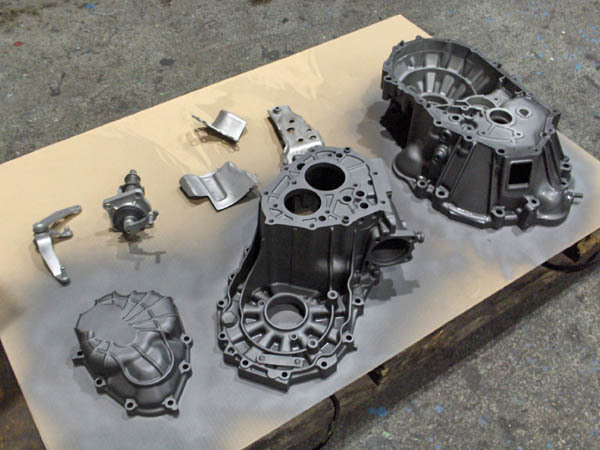 After the parts were sandblasted, they were spray painted with a heat resistant paint. Now you might be thinking: Those parts are made out of aluminum, so they can't rust. Why paint them then? But although aluminum can't really rust away, it can still corrode with aluminum oxide. It doesn't really eat into the aluminum structure of the parts, but it's not really a nice sight under the hood. 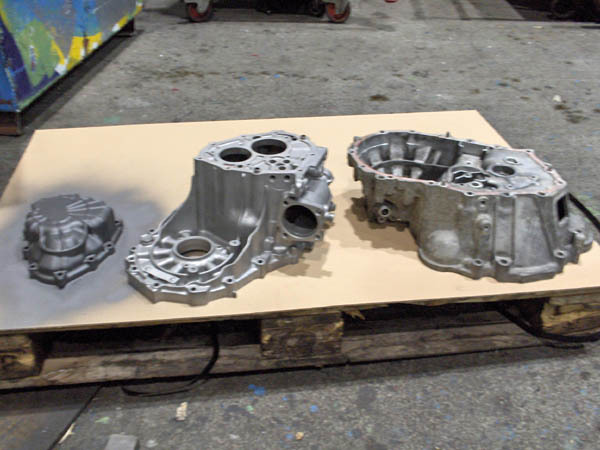 So to prevent this from happening, and give the engine and gearbox a more uniform look, I gave the housing parts a coat of paint as well. 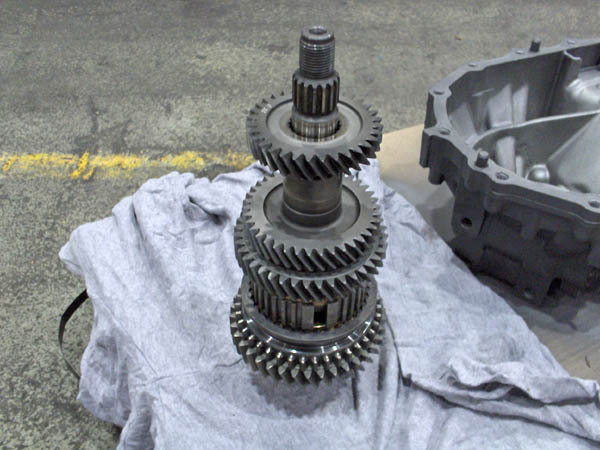 All the internal parts of the gearbox were blasted clean too. 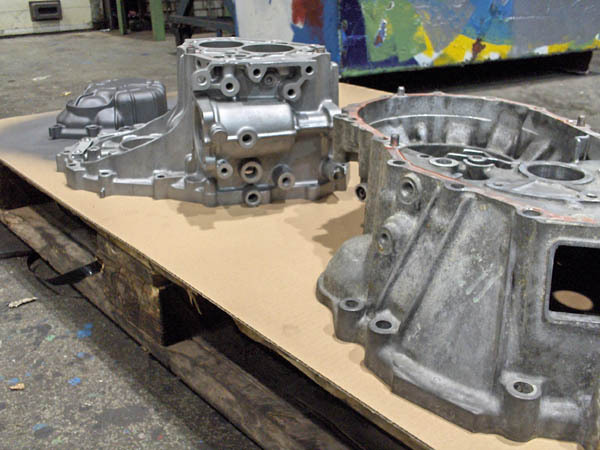 But clearly, these haven't been painted because they reside in a oil filled gearbox and shouldn't rust anyway. Now that everything is nice and clean again, I can start rebuilding the gearbox with refurbished and shiny new parts! Read all about the rebuild on the appropriate page.